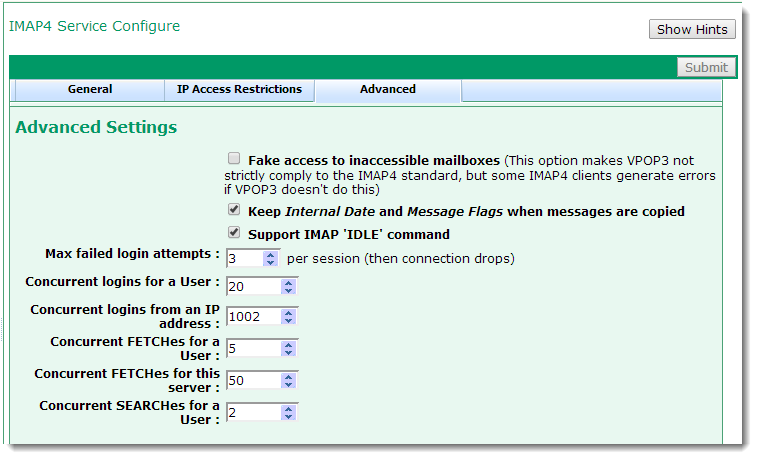 The IMAP4 Advanced tab lets you configure rarely used settings for the IMAP4 server component of VPOP3 Enterprise. The Fake access to inaccessible mailboxes setting lets VPOP3 act in a way which enables older IMAP4 email clients to work better. In the IMAP4 service you may have folders which do not exist. For instance, if you are accessing a shared Inbox folder from a user called 'Karen', then their folder will be called #users/Karen/Inbox. The #users and #users/Karen folders are not actually present, but will be displayed in a folder tree. This can upset some older email clients, so VPOP3 can pretend those folders exist, but don't contain any messages. For strict IMAP4 standard compliance the Keep Internal Date and Message Flags when messages are copied option should always be checked, but in some cases people have preferred for it not to be checked. Each message has meta-data containing the Internal Date (when VPOP3 received the message) and Message Flags (read, deleted, flagged, replied etc). If this option is unchecked, then when messages are copied to another folder, this meta-data is reset. The Support IMAP 'IDLE' command option lets you enable or disable VPOP3's support for the IDLE command. The IMAP IDLE command is a way of implementing 'push' notifications to an IMAP4 client. Normally, you would want this option to be turned on, but in some cases it has caused reliability issues, so it can be turned off if necessary. The Max failed login attempts option tells VPOP3 how many failed login attempts to allow before dropping the connection. The default is 3. The Concurrent logins for a user option limits the number of concurrent logins for a particular user. The main purpose for this option is that some email clients will connect to an account and instantly open up a connection for each mail folder which exists in that account. In some cases this can mean that VPOP3 suddenly has to handle 200+ new connections. It will do this, but it may take some time - the problem is that some clients will time out while this is happening, and will reconnect with a new 200+ connections. After a short time VPOP3 will grind to a halt processing new logins for a single user. Most well-behaved clients will limit themselves to 3-5 connections, so allowing 20 concurrent connections will allow about 4 people/devices to access the same mailbox at once. If you know that your clients are well-behaved you can increase this as necessary. If the limit is reached, then further attempts to log in will receive an error message Too many logins for this user. The Concurrent logins from an IP address setting is similar to the above setting, but restricts the number of logins from a single IP address. This is usually set much higher than the previous setting, because people often connect to VPOP3 over a shared connection, so many users will have the same IP address. If the limit is reached, then further attempts to log in will receive the error message Too many connections from this address! The Concurrent FETCHes for a user option lets you limit how many concurrent message FETCH commands VPOP3 will run for a specific user. Usually there will just be one or two FETCHes running at once, but badly behaved clients have been known to issue lots of FETCH commands which can overload the server. If more FETCH commands are issued than this option allows, VPOP3 will queue them up and wait for up to 40 seconds for a current FETCH command to finish. If no free FETCH 'slots' are available then an error Too many current FETCHes active will be returned. The Concurrent FETCHes for this server option lets you limit how many concurrent message FETCH commands VPOP3 will run on the whole server. If there are too many concurrent FETCH commands it can overload the server. If more FETCH commands are issued than this option allows, VPOP3 will queue them up and wait for up to 40 seconds for a current FETCH command to finish. If the timeout is reached then an error Too many current FETCHes active will be returned. The Concurrent SEARCHes for a user option lets you limit how many concurrent message SEARCH commands VPOP3 will run for a specific user. Usually there will just be at most one SEARCH running at once. SEARCH commands can be very time consuming and put load on the server, especially with large mail folders, so it is best to keep this to a small limit to avoid overloading the server. If more SEARCH commands are issued than this option allows, VPOP3 will queue them up and wait for up to 30 seconds for a current SEARCH command to finish. If the timeout is reached then an error Too many concurrent searches - try again later will be returned. With the various Concurrent limits, the main risk is that email clients will sometimes retry actions if the previous attempt took too long. This will mean that if the client retries after 60 seconds, and a SEARCH, for instance, will take 5 minutes, then the email client will issue a duplicate SEARCH command after 1 minute. VPOP3 will now be doing the SEARCH twice, which will take even longer. Then after another minute, the email client will issue another duplicate SEARCH command, slowing things down further. After a few minutes the server will have ground to a halt trying to process many identical SEARCH commands. There is not really a nice way around this from the server's point of view other than to block extra commands which is what these options allow. The email client should not really retry commands unless it has received an error such as the connection being dropped, or it should wait a lot longer than 1 minute.